The film's rapid-fire yet dull plot has been scrabbled together from a couple decades of comics mythology, sure to irritate fanboys and newbies alike. 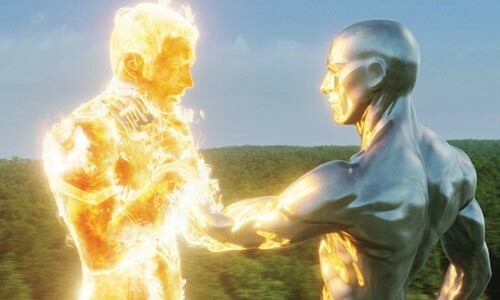 Dude, you're on fire: The Silver Surfer (right) confronts the Human Torch. Inadvertently mirroring our real world, Fantastic Four: Rise of the Silver Surfer focuses more on the minor tribulations of a celebrity wedding than the tragic global events that harbinger the end of humankind. Adapted from the long-running Marvel comic, Tim Story's actioner catches up with the heroes of 2005's Fantastic Four. Our quartet of superheroes -- Sue Storm a.k.a. Invisible Woman (Jessica Alba), Reed Richards a.k.a. Mr. Fantastic (Ioan Gruffudd), Ben Grimm a.k.a. The Thing (Michael Chiklis) and Johnny Storm a.k.a. Human Torch (Chris Evans) -- are still squabbling. Sue and Reed's upcoming wedding, complete with paparazzi, is causing grief, and flaming Johnny is still a full-on tool in a logo-covered unitard. The impending nuptials lead to a pointless excursion to a Manhattan disco, where Reed goes crumpin' bendy-style, wrapping up hotties in his 10-foot-long arms while the future Mrs. Fantastic fumes (this flirting simply begs the sick question of Mr. Fantastic's beyond-human bedroom skills). This is action? Such scenes are lamer than a teen-soaper on TV, and about as well acted. Meanwhile ... a blur of silvery light is zipping around the planet causing intriguing destruction: In Japan, the sea turns solid; snow falls in Egypt; and giant holes are bored in the earth. All this unusual activity at least catches the eye of the military, who bring in the Fantastic Four (mid-wedding) and their arch-enemy, Dr. Doom, to chase after the planet-wrecker, revealed to be the nimble, shiny and oh-so-mysterious Silver Surfer. The film's rapid-fire yet dull plot has been scrabbled together from a couple decades of comics mythology, and is so woefully underwritten it's sure to irritate fanboys and newbies alike. The overarching comic premise of superhero matrimony is dead on arrival, and quips meant to paper over one-dimensional characterizations repeatedly fall flat. At best, Surfer offers brainless eye-candy -- whether it's the special effects, the presumably real charms of the curvy Alba and square-jawed Gruffud, or the dreamy combination of FX and man that is the Silver Surfer. All bright, reflective sinews and fluid shininess, the Surfer is a nearly perfect humanoid specimen, with six-pack abs, throbbing neck veins, limpid eyes ... and a Ken-doll nub between his legs. Yet despite this odd neutering, the Surfer is the only person of interest in this tepid mess. Though his backstory is barely explored, his conflicting imperatives -- the Surfer has traded the salvation of his home planet for a job helping to destroy other worlds -- offer what little moral introspection F4 can muster up. And behind the shimmering surface, the Surfer is comprised of the film's two best actors: His underlying acrobatic motions come courtesy of Doug Jones, who recently portrayed both Pan and the Pale Man in Pan's Labyrinth, and his mournful voice is supplied by Laurence Fishburne. Sail on, Silver Surfer; you're too good for this film.